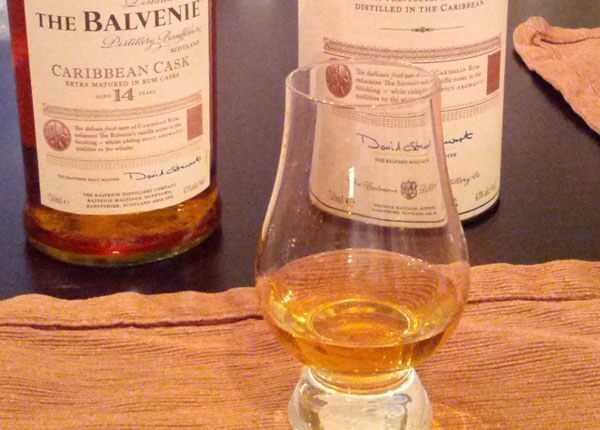 Revisiting my favorite brand once again, I’ll be reviewing the Balvenie’s 14 Year Caribbean Cask. My father asked me if I wanted to have a dram of this recently while I was visiting for dinner. Who I am to disrespect my elders? This is one of only a few whiskies my father has ever liked enough to buy for himself and I know exactly why. He’s got a bit of a sweet tooth so this is a perfect fit. Quick backstory on this particular offering. The Caribbean Cask expression was developed especially for the U.S. market by David Stewart, long time malt master (and all around awesome guy) of The Balvenie. As it turns out, The Balvenie buys unaged rum from the Caribbean, ages it in barrels on site, then sells the aged rum BACK to the rum producers for more than they paid for it. How’s THAT for smart business? They then take whisky that’s been aging for at least 14 years in traditional oak barrels and finish them in these newly-emptied rum casks for a few months. This is a different approach than the limited edition Balvenie 17 Year RumCask in which the whisky is actually aged for in rum barrels for much longer. Still, the finishing technique imparts plenty of unique flavors to the typical Balvenie profile. Nose Very sweet and spicy, creme brûlée with burnt caramelized topping, American oak vanilla. With water, a lot more vanilla influence, some black cherries. Man, so much caramel… After several minutes, some pencil wood pokes through. Taste Holy spicy! Honey, sugar and caramel sweetness abound. Wow… With water, the fruit comes forward a lot. The spicy sweetness doesn't go ANYWHERE though. This whisky is seriously liquid dessert. Finish A pretty delicate finish considering all that spice. Oranges and some tropical fruits gently fade away until there's just a hint of spice left. After several minutes, just a touch of dark chocolate comes out. Overall Thoughts There should be no surprise that I find this Balvenie to be INCREDIBLY sweet. In fact, I’d go so far as to say that The Caribbean Cask would fit in perfectly in your average bourbon tasting. If you’re a bourbon guy looking for something similar in the malt whisky world, look no further (well, I guess you could look slightly further to the Glenmorangie Nector D’or). I have to be in the mood for something this sweet. Still, this certainly has its place within the lineup of what continues to be my distillery of choice.